Heya everyone! First of all I would like to say a MASSIVE thank you to everyone who reads my blog. I've just seen I've hit over 25,000 views on my blog and I am so happy. I didn't think my blog would have this many views so thank you so much! Before I ramble on let's get onto the meaning of this post. With the festive season upon us, it is that time for parties and getting all glammed up in our best attire. I don't know about you but Christmas for me screams lots of sparkles and glitter. Obviously in moderation. You don't want to go out and end up looking like a piece of human tinsel! However, if that's what you like, that is a completely different story, but moving on. This nail polish has actually been in my collection since last year and I've never actually worn it before. 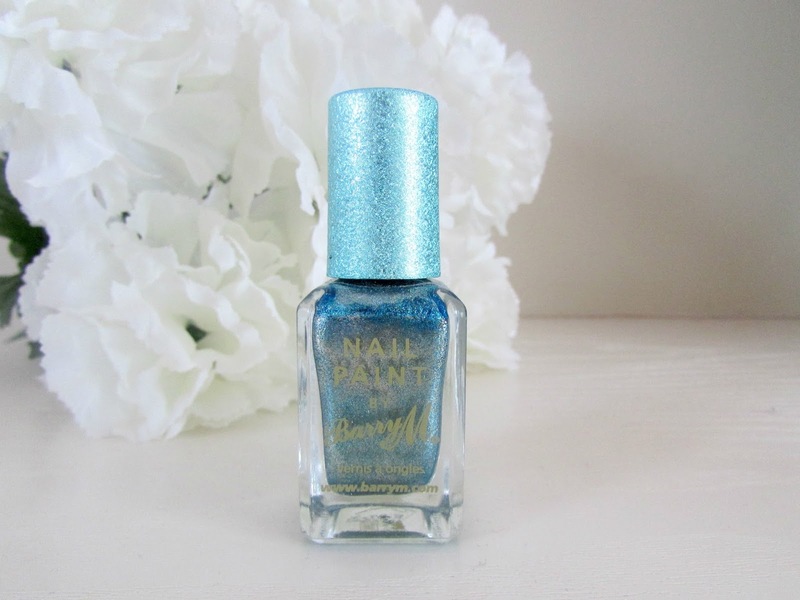 You all know how much I love the Barry M nail polishes so when I was browsing my collection the other day I came across this and I absolutely love it. It's a lovely sparkly blue shade that just looks so lovely this time of the year. 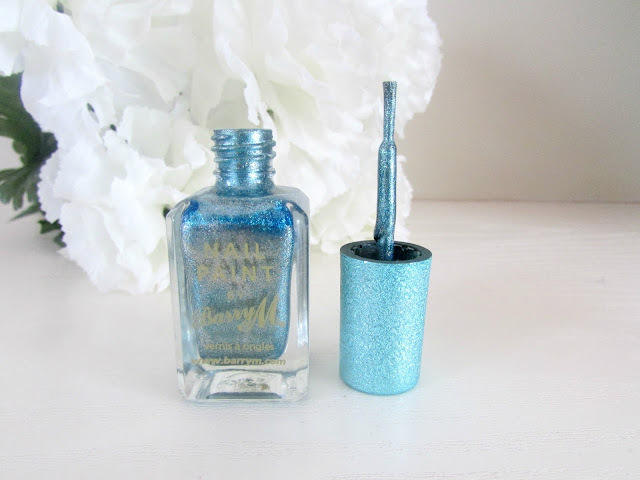 If you read my 'Nail of the Season' post then you will know that I am a huge fan of blue this time of the year and because this nail polish is so sparkly it's like frost on your nails. I love it so much. As you can see from the swatches above, this nail polish will work absolutely fine with one coat. 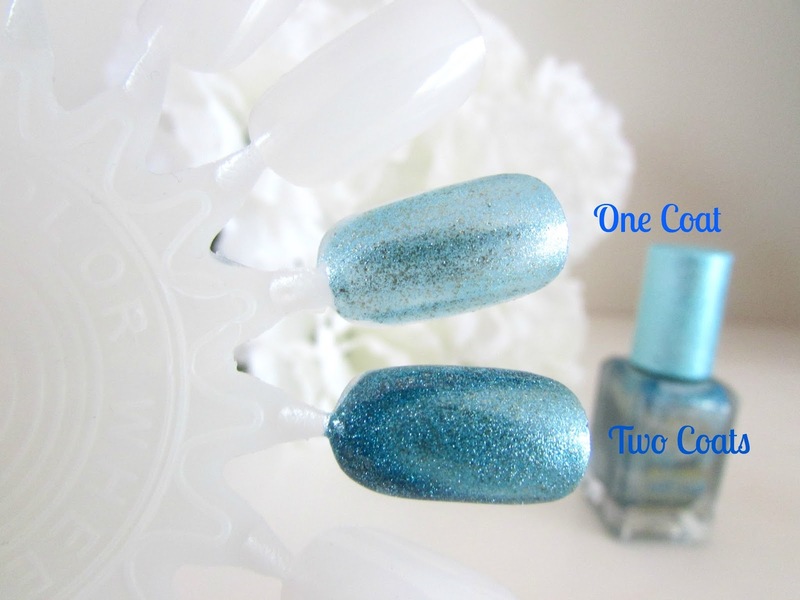 It's quite opaque which is quite unusual for a lot of nail polishes as normally you would need two or three. I like the fact it's quite a light blue shade on first application as well. If you want to intensify the color then you can go straight in with another coat to make it a lot darker. I will definitely be opting for both options depending on what event I will be going to. The nail polish lasts for at least 4 days without chipping which I think is pretty impressive for a nail polish and it dries super quickly as well. Perfect for you girls, if like me, you absolutely hate standing or sitting around waiting for your nails to dry. Like I mentioned above I found this polish in my collection and remembered it was from Barry M's Christmas collection last year. However, having been in Superdrug quite recently I've noticed they have a lovely barbie pink and a gold shade out as well. If you don't like the sound of this Barry M have also got a gorgeous line of glitter nail paints in all shades that have both a normal finish and a textured finish. So definitely head to Superdrug if you are intrigued by that information. Are you a glitter fan? Did you try this nail paint last Christmas? What are your favorite polishes to wear over the festive season? Yeah two coats definitely look better! I know, same here! Love their nail polishes!